He claims that by working just 15 minutes per day members of his system will be able to see profits of over $3,000 per week all by publishing simple posts on Instagram… But is it really legit or will the Insta Profit Hack system scam you instead & just see you spending more than you ever actually manage to make? What Exactly Is The Insta Profit Hack System? The Insta Profit Hack system isn’t really a system at all – it’s actually just a guide that supposedly reveals a “hack” for leveraging a multi-billion loophole on Instagram & it’s allegedly been put together by a guy named Joseph Paul. So in short the whole thing has been put together by a guy who provides NO proof of any of the money he’s made which is a little odd, don’t you think? I mean why can’t he just share one of these Instagram accounts he’s making money from if it’s truly legit like he claims? And why has he chosen to hide his name (which is the common trait of a scammer)? But anyway, basically “Joseph” claims that the guide will show you how you can make money on Instagram in just 15 minutes per day by posting other peoples content & leveraging this so-called “hack”. But if you haven’t already signed up already then here’s a word of warning – don’t! The reason I say that is because the whole thing is essentially just a re-hashed version of the Easy Insta Profits scam that I exposed last year. How Does The Insta Profit Hack System Work? In short the Insta Profit Hack system is just your typical get-rich-quick scam. It promises the world, offers access for a seemingly low fee & then doesn’t live up to any of its claims on the other side but then instead tries to get you to spend even more money to get access to the “secrets” which don’t actually exist. That’s the reason the creator has chosen to hide his name – because he knows if he didn’t he’d likely have a torch & pitchfork crowd trying to hunt him down to get their money back after being scammed. 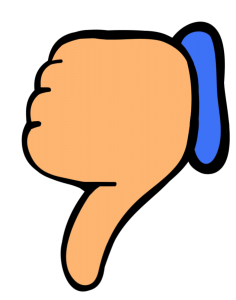 But don’t get me wrong, you do actually get something in return for your money – which is some extremely basic training on something called affiliate marketing. In case you don’t know, affiliate marketing is where you promote products online in return for commissions – and I’ll admit here that in itself it’s actually a GREAT way to make good money online, and it’s the same way I personally make money too. And whilst that’s the “bare bones” of how it works, that alone won’t really help you find any success. Instead if you truly want to find success through affiliate marketing then you need a legitimate proven platform like Wealthy Affiliate. For $7 you might be thinking “what the heck, I’ll try it out” but that’s exactly what the creator of the system is hoping for because the “true” scam actually starts on the inside when the upsells begin. You see the $7 is merely an entry fee (even though the main website makes it look like the whole thing costs $7). After paying that $7 you’ll be asked to pay more & more – and you guessed it, more & more! Honestly the guy behind this thing is just trying to squeeze as much cash out of all of the members as possible & no matter how much you spend on it your chances of making money with it will sadly still remain slim to none. And The Testimonials? Fake Too! Right at the bottom of the Insta Profit Hack website there’s a man named David Legg who claims that Joseph Paul is the real deal. Well we now already know for ourselves Joseph isn’t the real deal, but neither is David Legg! 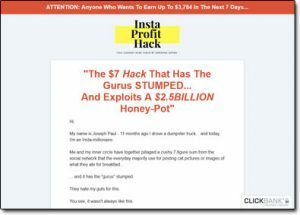 My Verdict – Is The Insta Profit Hack System a Scam? I know my answer is going to be a bit controversial here because yes you do indeed get some training provided to you via the Insta Profit Hack system, however due to how misleading it is in my opinion I am going to say that yes, I do believe it to be a scam. I mean it’s quite clear to me that the creator of the whole thing has just set it up purely to make himself wealthy at the expense of the members. He doesn’t really care about anyone’s success & he’s probably never had success through Instagram himself, hence why he doesn’t show any proof or show his real name. Plus if you do happen to buy into it (which I don’t recommend) then the training you are provided with is super low quality & I know it’ll likely just leave you feeling disappointed – even if you only spend the $7. So take my advice & if you really want to learn how to make good money online through affiliate marketing on Instagram (or with a website) then join Wealthy Affiliate instead as not only is it free, but it’s legitimate & proven – unlike the Insta Profit Hack system. And also if you’d like to try some other ways of making money online then don’t forget to check out my list of all the top picks I’ve put together here too.